The announcement of and the invite to Google’s latest attempt at social networking brought with it hopes of an internet utopia: users sharing specific, relevant content to groups divided either by relationship to or shared interest. Finally, I could share tech news with those I consider business associates, pet pics with my family and x-rated comments and images with my friends. Sorta like web-based email groups, right? This excited me. I was tired of the constant stream of crap updates on Facebook and pointless retweets on Twitter. Call me difficult, but I’m here to learn, be inspired or socialize; baby pics from people I don’t know and parroted opinions don’t do that very well. I dove into Google+ like the rest of the geeks did. I followed everyone I recognized and branched out a bit by following people already popular on other social networks. I figured Google+’s new way of arranging contacts would help me rid my stream of the noise I’ve grown tired of. I was an idiot. It took three days before the first pet pics where posted, baby pics followed soon thereafter. 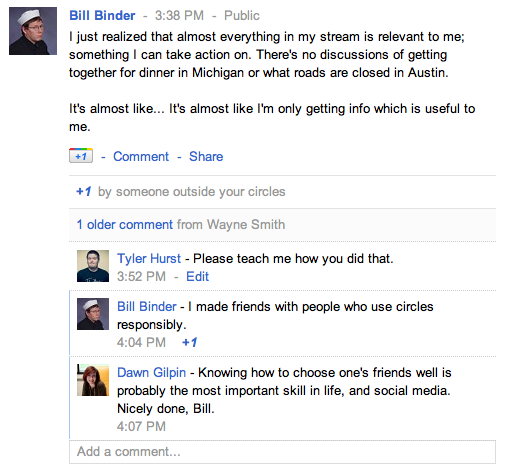 The A-Listers all wrote blog posts about how Google+ could help people, but one stood out. Louis Gray, popular tech writer (I’m not certain as to what exactly he does) wrote a post admonishing a reader who dared attempt to tell him exactly how he should be using Google+. I completely get the guy’s point. He follows Gray because he wants to know about tech, not because he cares about pictures of Gray’s kids. This makes sense, as I often follow people because of specific interests, while tolerating all the other updates that don’t pertain to me. Google+ was supposed to change all that. Finally, people would curate their updates and only post to specific audiences, so the public at large could–as long as the person uses their Circles “correctly”–cut down on noise and only get the meat they desire. That didn’t happen. No matter how much any of us would like to connect with people that my teach us, it just isn’t possible by adding “friends” the social networking way (adding by interest or friends of friends). Gray is right, social networking is about people, but most of those people don’t care much about the people that listen to them. And they shouldn’t. Gray publishes what makes sense to him, I tweet what I think is funny and you hopefully post whatever you think is great. This means we often won’t give a crap about what the other posts, and there isn’t anything, nor should there be, we can do about it. Choose your friends better. The onus is on each of us to make technology, not people, work the way we want it to. Let’s save the “you’re not doing it right” conversations as joke fodder during geek conferences. We can’t change people, but we can choose to ignore them. It’s not personal. Most of us aren’t really friends in the first place. See, we use social media a bit differently than most people. I don’t follow a ton of people because I like to have closer relationships with those I interact with. We may not be close, but we’ve drank together, listened to music together and hung out more than a few times. My post was intended to say that people have the option to hide and filter as you like. It didn’t make much sense for this guy to tell me what I share any more than I should tell him what to share. I know people follow me for tech, and tech is 90% of what I share as a result. I don’t talk much about sports (Watching the All-Star Game now) or about traffic, pets, cars, etc. The family became part of the conversation when we had twins in 2008. The social networking relationships I made practically demanded it (especially FriendFeed). Optimizing for this one guy as opposed to the dozens or hundreds of others who wanted the occasional baby pic would be overdoing it. The right way, in theory, is to poll all the people who follow me and get their permission to share baby pics, make a baby pics circle and be on with it. I’ve learned this doesn’t really work, and I do share to smaller circles where it makes sense. As for A-Listers, I never call myself that, and I do care. One of the things I wrote about last week is that you should always participate and talk with everyone, whether you’ve heard of them before or not. It doesn’t mean we always agree, but we should listen and respond (like I am here and like I did to that guy when I said we disagreed). As for the “real” A-Listers, those who like to hear themselves talk vs those who want to engage get discovered pretty quick. BTW – my “real” job is VP of marketing at my6sense. I am also managing director of new media at Paladin Advisors Group. That’s all in my blog bio. We agree about far more than we disagree on this issue. The dream of social media utopia many of us have requires too much from everyone to make it work. And you’re an A-Lister, Louis. Doesn’t make you a jerk, just means you’re popular. I think this is an interesting perspective, but mostly because it’s so far to the other side of the spectrum from how I feel about social media. What I love about facebook (and admittedly, I’m less good at twitter and I ‘get it’ less) is that I can interact with and get into the head of people I may have only had a very tenuous connection with in real life. There are people I went to high school with who I maybe only spoke to 5 times in 4 years, but now I realize we have the same sense of humor and opinion on politics. The mom of one of my clients (who I’ve never met in person), I now feel like I know personally. So to me, the whole ‘just putting it out there’ side of facebook is what I love. and I adore baby and pet pictures from random people. I love the personal side of people. But hey, Google+ lets you block me. So there’s that. But I do see those pictures on Facebook and the ones your husband takes on Instagram. I like looking at them, because your family is so happy. But we know each other. That’s the point. We’re connected more than JUST digitally. I’m friends with your husband. I do treat my connections like friends, at the exclusion of more distant relationships. But that’s me. It’s not for everyone. I’m starting to suspect that many of them are being paid by Google to initially engage with people. I say that because their posts are so irrelevant, which they are not usually. Like – “What’s your Meyers Briggs type?” or “Here’s how you use Google+” and they are posting every few minutes. Something (1) they never do and (2) who the hell is doing their day job while they do that? I’m on to them…and also jealous Google didn’t ask me. I’ll see about getting you on that list. Remember: there is no such thing as information overflow.